Disclosure: This post is part of the Tresomega Nutrition Blogger Recipe Challenge. I received complimentary products to use in this post. All opinions are my own. I have a plan for Christmas this year. Instead of doing the big ham dinner that involves being in the kitchen for hours, we’re just going to make a bunch of appetizers and spend the day hanging out. It sounds lovely, doesn’t it? This is one of the dishes I’m planning to make. It’s filling enough that it could count as a meal, but it’s also something we can eat while lounging around the Christmas tree. It’s pretty much the prefect holiday bite: spaghetti smothered in a to-die-for alfredo sauce, topped off with a miniature meatball and some homemade tomato sauce. And some more cheese just for good measure. Are you drooling yet? 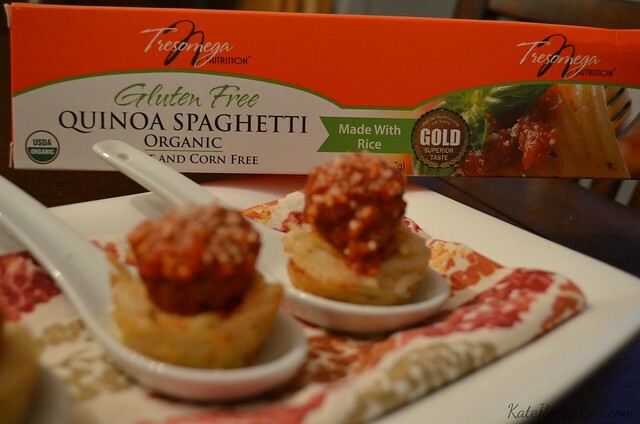 This recipe features Tresomega Gluten-Free Organic Quinoa Spaghetti. We have a few gluten-free family members so we’ve tried a bunch of gluten-free pastas and I can say that this is hands down the best one I’ve tried. My husband – who grew up in a very Italian family – admitted he wouldn’t have know it was gluten-free pasta if I hadn’t told him. Win! For more recipe inspiration, you can visit them on Facebook and Twitter. You can purchase Tresomega products at: Tresomega.com. Sams.com, Amazon.com and Walmart.com. Meanwhile, combine the butter, whipping cream and cream cheese in a saucepan over medium heat – stirring frequently until all melted together. Stir in 2 minced garlic cloves, the garlic powder, 1 tsp. Italian seasoning, salt and pepper. Cook, whisking frequently, until smooth. Add the parmesan and stir until melted. Bring to a simmer and cook for 3-5 minutes more. Preheat the oven to 350 degrees and spray a mini-muffin pan with non-stick spray. Using a fork, twirl up some sauce-coated spaghetti and place in the well of a mini-muffin tin to form a little next of spaghetti. Press down slightly to pack and add more spaghetti if necessary. Repeat until all wells are filled. While the spaghetti bakes, combine the remaining ingredients, except parmesan cheese, in a saucepan. Bring to a boil and then reduce to a simmer. When the spaghetti is done, let cool in the pan for 10 minutes then use a spoon to scoop out the spaghetti bundles and place on a serving platter. 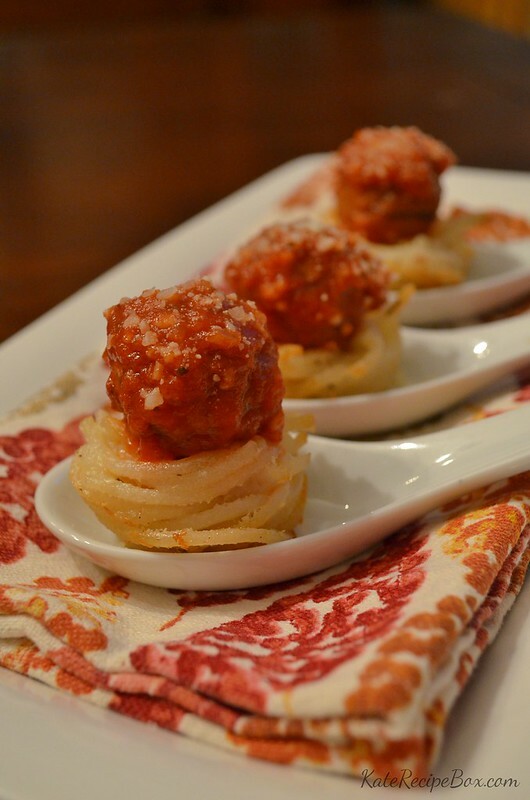 Top each bundle with a meatball, 1-2 tsp. of sauce, and parmesan cheese, to taste.